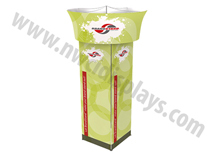 Trade show towers are designed to make a statement at the show! 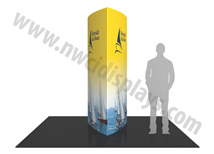 We offer a full line of tower options to match your booth style. The Brandstand Blimp Towers are a great solution to traditional hanging banners as it stands 14 feet tall and includes a rotating motor to keep it spinning throughout the show! The Formulate Tower line offers a cleaner look with multiple height and shape options. Freestanding towers will help lower show costs because there is no need to pay for labor to suspend a hanging sign! Our fast turnaround means this can be ready for your next upcoming show! 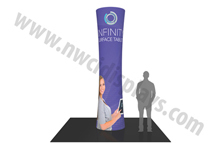 Formulate Cylinder Towers - 8ft, 10ft and 12ft Heights! 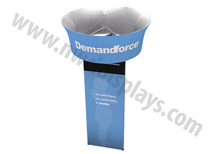 Formulate Four Sided Towers - 8ft, 10ft and 12ft Heights! Formulate Shield Towers - 8ft, 10ft and 12ft Heights!